hundreds of miles to cities in the line of totality, like Nashville, Tennessee and Salem, Oregon. But there is one thing that could put a damper on the event: clouds. 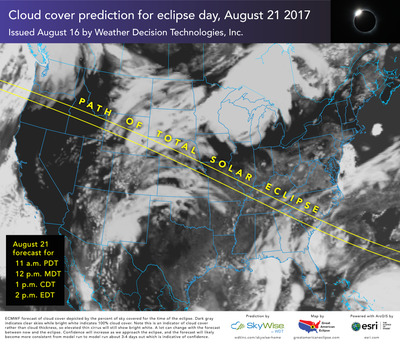 , a geographer at Esri, is producing new maps every day leading up to the eclipse. As you can see in the map below, clouds could obscure the eclipse in most states in its path of totality, including Wyoming, Nebraska, Kentucky, and Tennessee. Idaho and Oregon are the only states where the sky could be mostly clear in the zone of totality. We’ll continue to update this map as it gets closer to the eclipse. Michael Zeiler/GreatAmericanEclipse.com; ArcGIS/EsriA weather map for the time of the August 21, 2017 eclipse, as of August 16.
is an astronomical phenomenon that occurs when the moon passes between Earth and the sun, and appears to cover the latter. The two other types of eclipses are annular and partial, when the moon doesn’t completely mask the sun. Solar eclipses look different depending on the location. On August 21, the total solar eclipse will only cut through a 70-mile-wide band of the country, stretching from the northwest to the southeast US. Everyone in the US — from Maine to Alaska — will be able to experience at least a partial eclipse, weather permitting. For most of the US, the eclipse will happen around lunchtime.